Just a short note to let everyone who may be looking at this blog that after a 40 plus hour journey we have made it safely to Durban. Along the way we met a couple who were in the same ward in Centerville with our good missionary friends the Taylors, a young man on his way to Arizona, a couple from Bristol who were traveling to South Africa for a holiday, and a young father who was traveling to Durban to visit his family. In all cases we were able to give them a pass-along card and in the case of the young man we got his contact information so the missionaries in Johannesburg can visit them. We were met in Durban by Sister Mann who took us to a lovely bed and breakfast owned by a member couple. We had hot baths and naps and are almost back to feeling human. We thought we did not have the right plug to get power to our computer but through a tender mercy of the Lord we just happen to bring the exact two adapters that that we needed. Neither of us realized we had done this and were very surprised that it worked. We are now going to read some literature that we received from sister Mann and try to go to sleep. This entry was posted in Mission - South Africa on January 31, 2009 by Bill. It is good to know she has a great desire to learn to read. Now if she will just learn to pick up after herself her parents will even more pleased. This entry was posted in Mission - South Africa on January 26, 2009 by Bill. It started on Sunday and by Monday morning there was 6 inches or more of heavy, wet snow on the ground. There was probably more water in those 6 inches than in the 20 plus inches we got two weeks ago. I decided it was Utah’s way of saying Goodbye to us. The same thing happened when we left for Indonesia. Here are some of the pictures I took to show those in South Africa what it is like here. The one on the left is looking due South through the front window. If you look close you will see our neighbor, Cline Black, house peeking through the snow covered branches. The one on the right is looking Southeast at another neighbor’s house. These are how some of our garden friends are doing. On the left is our Snowbird, in the center is one of our tree gnomes who you can see needs dental work, and on the right is our wind sculpture that seems to have turned into an ice sculpture. Our first week as missionaries was spent at the MTC. 23 couples – including us – and 2 single sisters were in our group. Monday is spent mainly checking in, getting acquainted and getting a very brief outline of what we will do for the rest of the week. About the half the group were going on their 2, 3 or 4th mission. 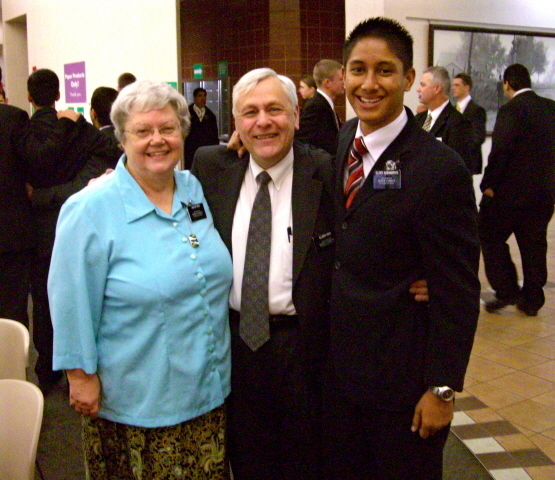 Included was Elder Steward who is a former mayor of Provo and his wife who are serving their 3rd mission. The majority of the couples are serving in the US with four or five going to Nauvoo. Couples are also serving in England, Germany, Korea, Taiwan, and Thailand. It was wonderful to share a week with so many talented people. In the MTC we meet in both large group and small group classes. I especially enjoy the small group meetings because we got to know three wonderful couples – Hallidays, Evers and Kerswells – and two fine teachers – Sister Pinegar and Brother Andelin. The quality of the young teachers is amazing and their enthusiasm for the work shows in their faces. One of the great things about the MTC experience is being among 2800 young missionaries who have left their homes for 18 to 24 months to serve their God and invite others to come unto Christ. As we sat with them during meals and heard where they were going and how excited they were to serve, it built up our spirits. I managed to catch a cold and Mary was having problems with her back but none of that damped our spirits as we had the opportunity to teach the first three lessons from Preach My Gospel and practice working with less actives. It is interesting that I had a cold the first 10 days I was home from Indonesia and it looks like I will have one for the last 10 days we are home. In between I never had a sniffle. Hopefully this will be the last one until we get home from South Africa. All in all there is no way to explain the special feeling of the MTC to anyone who has not been through it or served there. We have been blessed by our prior service as full time missionaries at the MTC and our experience of being there before leaving on our mission to Indonesia. This is our small group class. From left to right – The Kerswells, the Hallidays, the Piers and the Evers. Although they were taken days apart our teachers, brother Andelin and Sister Pinegar, both stood in the same place. The Kerswells and the Hallidays are going to Los Angeles to work in the Genealogy library and the Evers are going to Cleveland to serve as Record Preservation missionaries. 6 years ago Sister Evers was told she had two years to live but she obviously proved them wrong. We count it a blessing to have the opportunity to get to know these three couples. We really are not serving in the Indian Ocean we just moved our fingers when the picture was taken. Well at least we do not think we will be serving there but then we never know where the Lord will have us serve. On Monday we got to have lunch with Elder Ezra Subandriyo who we knew from Indonesia. He left the next morning for Ogden, Utah. Elder Subandriyo will be a great missionary. His love for the gospel shows in his eyes and his smile. We told him we would see him when we get back. He will have about 5 more months to serve. Well it is official – we are now Elder and Sister Pier. How wonderful it was to be surrounded by family and friends as hands were laid upon our heads and by the power of the Priesthood be set apart to serve in the South Africa, Durban mission for 18 months and receive great blessings of support. I had forgotten that President Jackson received a commission from the First Presidency to have the authority to set us apart. Also in the circle was Bishop Peterson, Kevin Kelly, Nate Tanner, Tom Alexander, and Bob. I got to join it when Mary was set apart. After we were set apart President Jackson asked Cindy to be the scribe and write down the reactions of the grandchildren to being there. I amost forgot that Jim was able to take part in the setting apart through listening on the phone. It was wonderful to have Bob, Cindy and Tom with their families at sacrament meeting. Also there was Melvin and Fran Anderson and Cathy and Glenn Roberts. I think we both did well with our talks. Of course as usual my prepared talk mainly went unused. But the Lord truly blessed me as he always does. My theme ended up being about trusting Christ and I did. After Church we spent some time talking to the Roberts. What a great couple. Cathy is recovering from knee surgery and this was the first time she had been out. We felt honored that she would take the effort to come to hear us speak. They could not come back to the house because she needed to get home and rest. The Anderson’s did come to the house for a while. They are among our oldest friends. I was really surprised when Fran said that she always enjoys my talks and still remembers a talk I gave over 40 years ago in Inglewood Stake. When she told me about it, I did not remember ever giving it. They are going to be a great missionary couple when they can serve. We have been truly blessed with family and friends. But the greatest blessing we have is knowing our Redeemer, Savior and God, Jesus Christ and being able to always have His spirit to be with us. This entry was posted in Mission - South Africa on January 19, 2009 by Bill. We received an email from President Mann today saying that our first assignment will be in Swaziland to help another couple with the 4 branches there. He said that he thinks we will be there for 2 months and then move to Newcastle to take over from a couple that is going home. We are excited about having the opportunity to work in small branches and do proselyting. It is what we have said we wanted. So the Lord answered our prayers. It will be interesting to see where we stay in Swaziland. Since it is only a temporary assignment I doubt if they will have a house or apartment for us. But wherever it is we will make it work for us. We are hoping that we will be able to put together an area book with pictures and information on all the members so when new missionaries – young or senior – come they will know who is who right away. The Taylors are doing this in Jogya and the missionaries are trying to get it done in Solo. This entry was posted in Mission - South Africa on January 14, 2009 by Bill. It was a morning for doing a few things for getting ready to leave for South Africa. The first stop was the bank where we found that instead of ordering $500 worth of Rands as we requested the young lady order $100 worth so we will get to go back again to get the rest. We did get the problem of our debit card running out while we were gone taken care of – they can not extend the old one so they just ordered us a new one that hopefully will arrive before we leave. The South African money is bigger and prettier than Indonesian. Also we take a number of zeros off when using Rands. 100 Rands is about $10 – $10 was about 100,000 Rupiahs – now it is about 110,000. Desseret Industries has become a regular stop on Monday. Today we dropped off 3 good size boxes and a large bag. As the man dropped one of the boxes into an large empty bin I mentioned that there were some breakable items included. He did not seem to really care. I can understand that since he was working in 10 degrees F and had to keep moving or he would freeze. Interestingly enough I also had a chance to become more Spiritually ready at lunch time. I had not brought a book to read so I took in the September Ensign. There was an excellent article by Elder Cook called: Be a missionary all your life. That fit in perfectly with one of the goals of the South African Durban mission – Help members become effective life-long missionaries. The very next article was by a former mission president, Dale M Valentine, called Coming to Church, Becoming Converted that outlined 6 things we can do as members to help investigators feel the spirit while at church. I noticed that brother Valentine had died since he had submitted the article. It was another case of a voice speaking from the dust. I find my thought often going back to the talk by Elder Maxwell that is in the December 2008 Ensign. I know the idea of completely giving up my will to the will of the Father is possible if I just take one stepping stone at a time. It reminds me of Brigham Young’s idea that he tries to be a little more righteous each day and lets Eternity take care of itself. I have set that as my goal – to be more Christ like today than I was yesterday and let Eternity take care of itself. This entry was posted in Mission - South Africa on January 5, 2009 by Bill. One of the things I am doing to get ready to go on our mission is to clean up and clean out most of the drawers and cabinets in areas that will be available to our house sitters. I am doing this for three reasons. First so they have someplace to put their own things. Second because most of the areas I am cleaning up are a mess and have not been cleaned for years. Third because some things are personal and I really do not want to share. All this cleaning has led to the discovery of many memories. Just this morning as I was going through some files I found a letter to Mary from Brian that was very sweet and unfortunately undated. A Edgemont 11th Ward newsletter from June 1993 that had Jim’s mission address. Also it included the announcement of the return of the Jamisons and the Hoopes from being mission presidents. But the best part is that it has the logo that Jim drew and was used on all the newsletters for a number of years. As I rearranged the display cabinets I came across a number of keepsakes that I did not recognize and so I could not remember where we got them and why. Some Mary knew the why and where but others we could not come up with any information. It is too bad that we have so many things that we can not attatch to an experience so we can not relive the memories they might bring if we could. This entry was posted in Between on January 4, 2009 by Bill. Mary called the travel office this morning and we found that we are leaving for our mission on the 29th of January. We will fly American Airlines to Chicago – where we will have a four hour layover so we may get to say goodbye to Jim, Kristy and the girls – and then we transfer to British Airways to travel to London and then South Africa. It sounds like a long, long trip. The date suggests that the travel office thinks we are going to need for extra training as office missionaries. Since we are not going to do that, we wrote President Mann to see if we could pass on the training and get to the mission earlier. It is interesting that they wanted to keep us here longer than we needed to when we went to Indonesia. We were able to work through that so perhaps we can through this one also. I checked to see what the luggage limits were and was surprised to find that we not only get two 50 pounds bags each but also we can take as much as 40 pounds as carry on. I don’t think I want to try to carry on two 40 pound bags but it is good to know I can take 25-30 pounds without any problems. This means we can take an extra change of clothes and necessities so if our luggage gets hung up we will have clean clothes and a tooth brush. This entry was posted in Between on January 2, 2009 by Bill. I managed to write the date without changing an 8 to a 9. Perhaps there is hope for me yet. How appropriate to read this talk on the 1st day of a new year and just a few of weeks before leaving on our mission. In his wonderful and loving way he pointed out to me some of my weaknesses that I need to work on if I am going to a truly successful missionary and be fully worthy to be called a child of God. I count it as a tender mercy that the Lord had me read this today and I truly acknowledge His hand it this blessing. Earlier today I ordered a book and cds to help us learn Zulu. Hopefully it will help us be more successful missionaries. Unfortunately the Book of Mormon is not translated into Zulu so Mary and I will not be able to spend our mornings reading and translating as we did in Indonesia. But I am sure there are some church literature that has been translated so we should be able to do some work. We also plan to find a member who can teach us on a regular basis – something we should have done for bahasa Indonesian. On the 28th there were two powerful talks by two young people who have been away for a while. Kenneth Brewer has been attending Harvard and then went to China. Megan Shumway has been in Oregon serving a mission. Kenneth talk was about his experiences of being a Mormon in Harvard and China. He recounted that one day at Harvard a young woman asked him “How much of a Mormon are you?” I thought that was a great question and I wondered how I might answer it. Reading Elder Maxwell’s article today re-inforced this question in my mind. As he points out to become Christ like is a step by step process. The important thing is not to be discouraged by my weakness but encouraged to do better. Megan shared a number of inspiring experiences but one really hit me. She told about a sister they had tracted out and was baptized just before Megan was to come home. Megan got permission to go say goodbye. While they were sharing their love for each other Megan thanked the sister for allowing her to teach her the gospel. The sister responded with thanking Megan for knocking on her door. That really hit me and made me wonder what doors I have not knocked on that I should have. What neighbors did not hear the gospel because I did not knock on their door. I decided that I would pray to know what doors I need to knock on – not only on our mission but also when I am at home. I need to make the idea ‘Every member a missionary” mean something to me. Speaking of that I have been spending more time getting mentally and spiritually ready for our mission. I have been re-reading the information that we receieved from President Mann. I also wrote him about a couple of programs that are mentioned in the literature. He wrote back with two websites I could visit. http://durbanmission.blogspot.com/ is the blog Sister Mann keeps up about their experiences and has lots of good pictures. http://sadm.site50.net/ is a mission website that tells about some of the programs and ideas that are being used. The “Walkabout” program sounds like one that could be used in almost any area of the Church. How great it would be if members and missionaries could work together to bring the gospel to those around them. I sent the website to President Marchant yesterday and I think I will send it to Presidents Barrett and Creer today. I am looking forward to getting involved in it and the other programs that are outlined on the mission site. OK that is enough rambling for now. However I promise more to come as we get ready to leave on our mission. This entry was posted in Between on January 1, 2009 by Bill.